Ok, so this is a little overdue post. The subject matter has long been devoured over a new year office celebration. But I can still (almost) taste the luscious velvety chocolate! In a food processor, add all dry ingredients and pulse to mix. Add butter cubes and pulse till mixture resembles coarse breadcrumbs. Gradually add the egg and pulse till the dough forms or till the sound of the mixer changes. Do not overmix. Transfer into a medium bowl and bring together to form a ball. 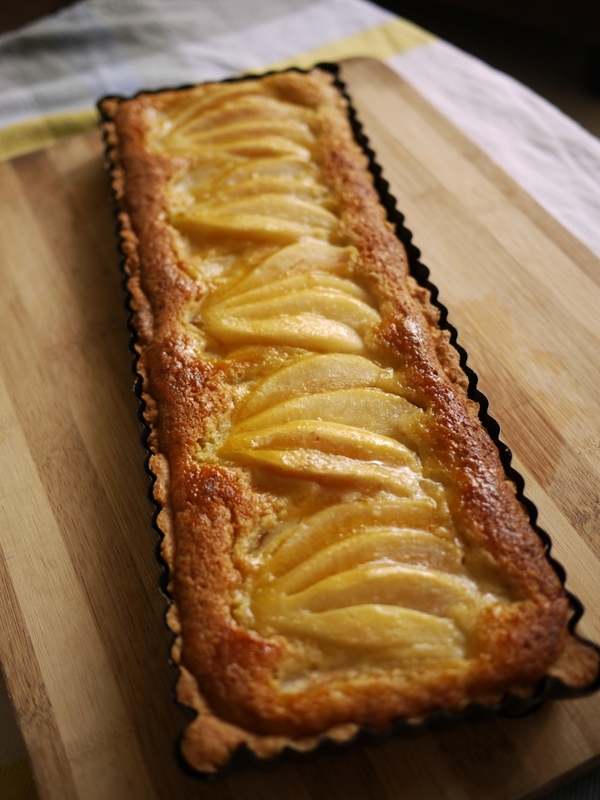 Press into the tart tin and chill the dough in the fridge for 2 hours or in the freezer for half an hour. Preheat the oven to 180 degree Celsius. Cover tart base with parchment paper and weigh the dough down with a layer of dried beans. Blind bake the dough for 15 minutes. While the tart base is baking, make the filling (see below). Remove the beans and parchment paper and bake again for 5 minutes. Turn the oven down to 170 deg Celsius. In a saucepan, slowly bring the milk, cream and sugar to a boil. Remove from heat, add Earl Grey powder let it sit for a minute. Add the chocolate chunks and whisk until smooth. Add the egg and egg yolk and whisk again. Put the tart tin into the oven, pull the rack halfway out and carefully pour the chocolate mixture into the tart shell to fill it up to the brim. Bake for 15 minutes. The center will still be wobbly after baking but will firm up when it cools. After cooling, refrigerate for at least 3 hours or overnight. 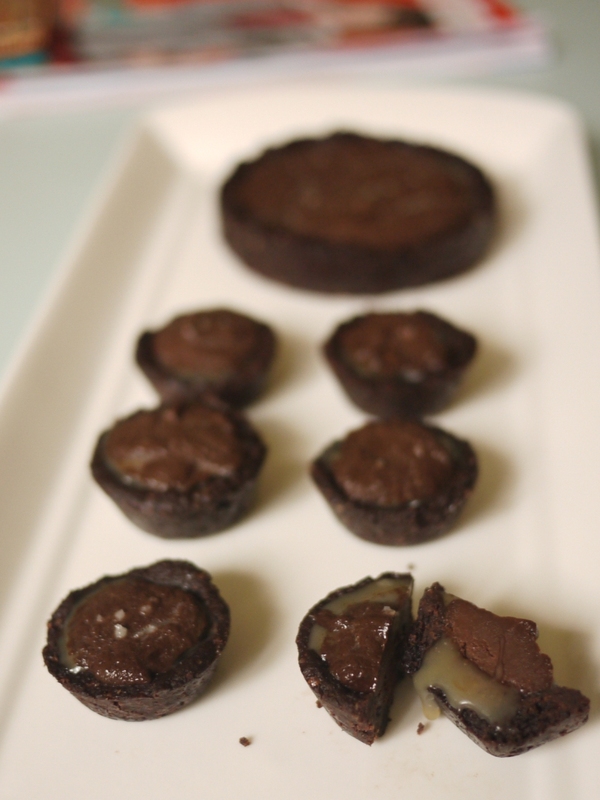 This entry was posted in Bake and tagged chocolate, Earl Grey, tart on January 17, 2013 by three3seconds. I remember that I (Yes, Me!) used to make this blueberry boy bait cake and it was SO GOOD. I especially like the way the blueberries color the pastry, makes it all so pretty with the swirls of blue/purples. So when the blueberries in the supermarkets were going at less than $5 for 2 punnets, and the apricots at less than $5 per punnet, we happily stocked up a few in the freezer so that we can make (Ok, zzz can ) make some goodies out of them. A good deal especially when these fruits can be quite costly (imagine $10 per punnet at times!) in Singapore. I always envy places where abundance of fresh fruits/berries can be used to make summer tarts of all sorts. I can almost imagine going to a farmer’s market and grabbing all those fresh products! In a food processor, pulse the dry ingredients. Add butter and pulse until mixture becomes crumbly. Gradually add egg yolk and pulse till the sound of the mixing changes. 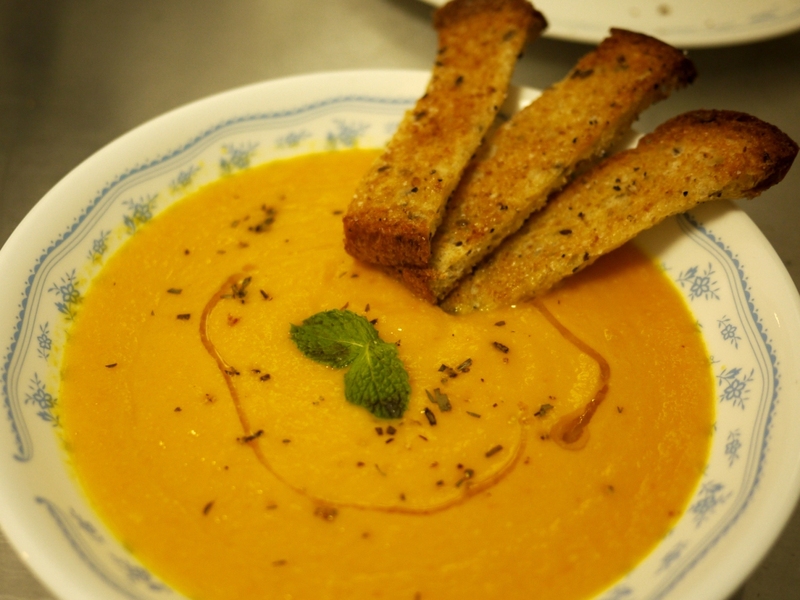 Turn out into a bowl and lightly knead just to incorporate any streaks of dry ingredients. Press the dough into a 35 cm by 12 cm rectangular tart tin (with removable base) and chill for at least 2 hour in the fridge or half an our in the freezer. Preheat oven to 180 deg C. Blind bake tart dough for 20 minutes. Remove beans/weight and parchment and bake for another 5 minutes. Skin and halve 6 small apricots. Poach them in your desired poaching liquid for 15 minutes. In an electric mixer, cream butter and sugar. Add the rest of the ingredients in the following order: ground almonds, flour, egg, vanilla. Spoon the almond cream on the partially baked tart base. Level with a spatula and arrange the apricot halves on top. Bake in 180 deg C oven for 15 minutes, add blueberries and bake for another 15 minutes or until the almond cream puffs up slightly and turns brown. This entry was posted in Bake and tagged almond cream, apricot, blueberry, tart on January 5, 2013 by three3seconds. The allure of caramel. Almost any kinds of dessert taste good with caramel. Especially salted caramel ice cream. The sweet saltiness creamy mixture. Actually I would never say no to anything caramel. Especially if its paired with deep dark rich chocolates. Not very good for my diet. But. That’s for later. Add egg and vanilla into butter/sugar and beat for another minute. Sift flour and cocoa into another bowl and mix in sea salt. Fold the flour mixture into the butter mixture with a spatula until a crumbly mixture is obtained. Use hand to bring it together to form a ball of dough. 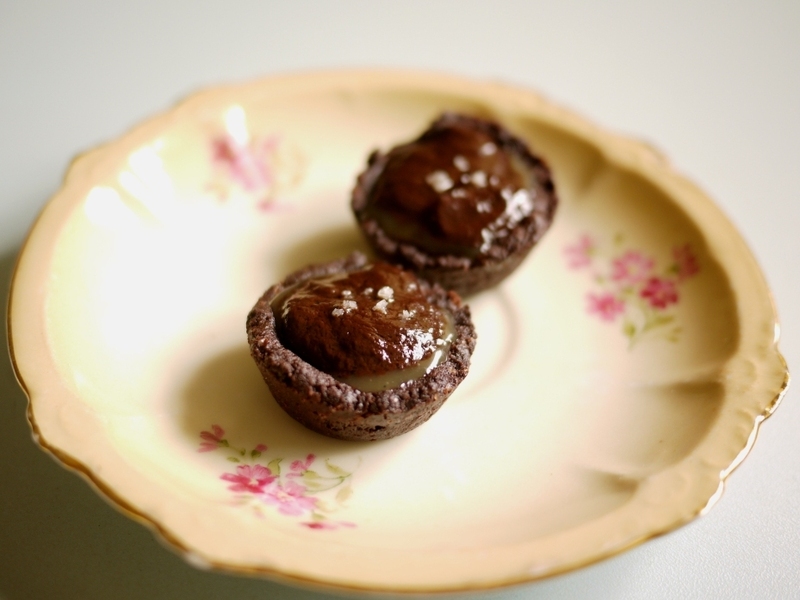 To make tartlets, form 1 inch balls of dough and press is into mini-muffin-moulds to form tartlet shells. 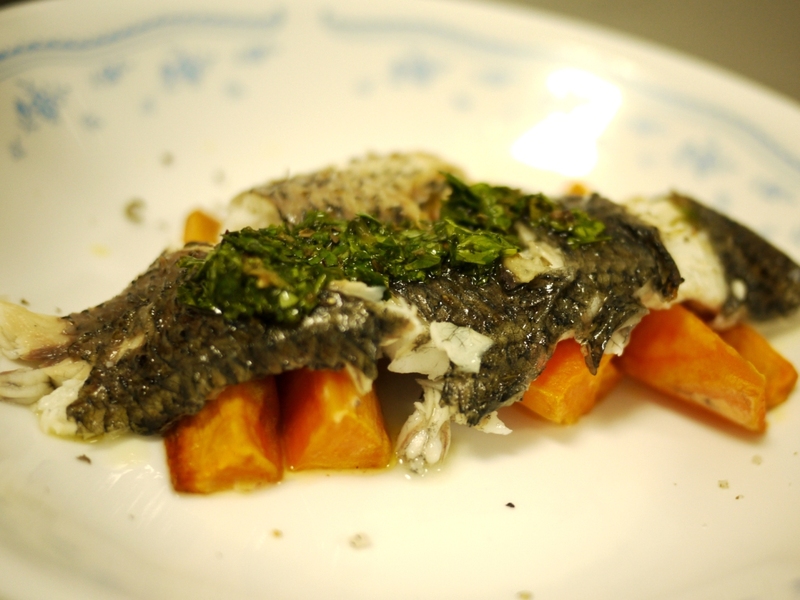 Freeze for 20 mins and bake in a preheated 180 deg Celsius oven for 8-10 mins. Remove from oven and press down any puffed up pastry with a teaspoon. Shape the pastry if necessary while it is hot. If pastry is not cooked to desired, throw back into the oven for another 2-4 mins. This recipe makes in excess of 24 tartlets. To make tarts, press dough into desired tart mould and freeze for 20 mins. Blind-bake (cover with parchment and scatter dried beans on top) in a preheated oven for 15-20 mins depending on size of tart. Remove the parchment and beans and bake for another 5-10 mins. Add water into a saucepan. Add sugar, making sure it forms a mound in the center with little touching the side of the saucepan. Bring to boil on high heat. Keep it on a boil at medium heat for 7-10 mins or until a beautiful toffee color is achieved. Add cream and stir. Add vanilla and salt if using. Keep stirring while bringing the mixture back to a boil. Turn off the heat and stir to cool slightly. Transfer to a heatproof bowl to cool further. Caramel will thicken while it cools. However if it is still too loose, you may bring it back to the saucepan and boil for a few mins. Heat cream in a saucepan until it starts to boil. Turn off heat. Weigh chocolate and place in a medium mixing bowl. Pour cream over chocolate. Wait for a minute and stir with a spatula until smooth. 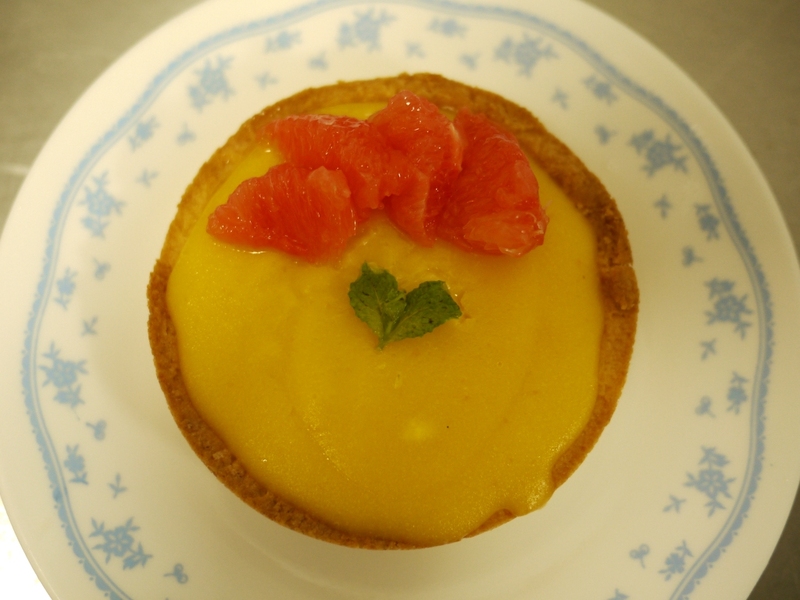 Remove tartlet/tart shells from moulds. Spread a layer of caramel to the desired level. Let it sit for a while to set if it is still warm and runny. Spread ganache to fill shell to brim. Sprinkle sea salt on top of each tart. 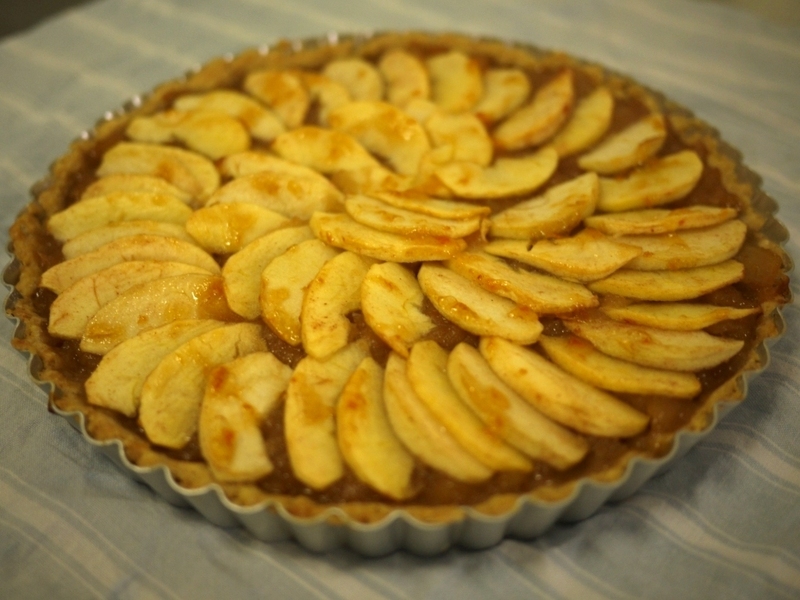 This entry was posted in Bake and tagged caramel, chocolate, tart on November 24, 2012 by three3seconds. 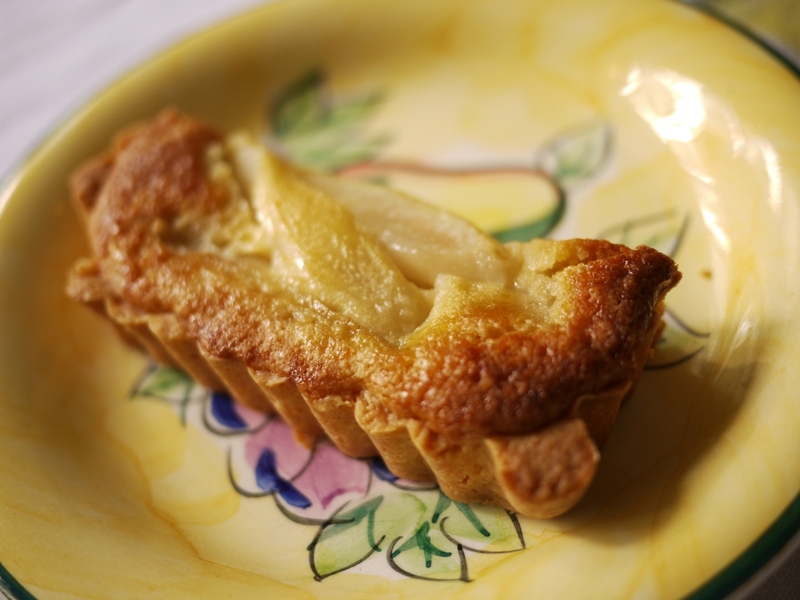 This entry was posted in Bake and tagged Pear, tart on January 3, 2012 by three3seconds.